Thurmalox 270/290 series coatings are high temperature, fast drying formulations based on silicone resins and thermally stable pigments. They are formulated specifically to protect stoves (wood, coal, gas, pellet, etc. ), hearth equipment and other metal surfaces operating at temperatures up to 1200°F (648°C). Thurmalox 270/290 series coatings provide outstanding adhesion, film integrity, color stability and thermal shock resistance throughout this entire temperature range. For exterior applications, use Thumalox 245 Primer on bare metal surface to seal and prevent rust. 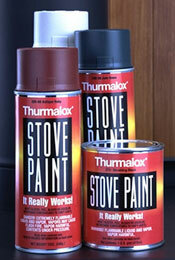 Thurmalox 270/290 series coatings are available in multiple colors.